This is such a hectic time of year. 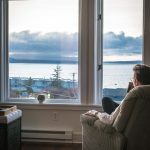 Not only do the days seem shorter, but people seem to move faster too. We want to accomplish so many things and check off all the important to-do’s from our lists. I think we all need a breather. 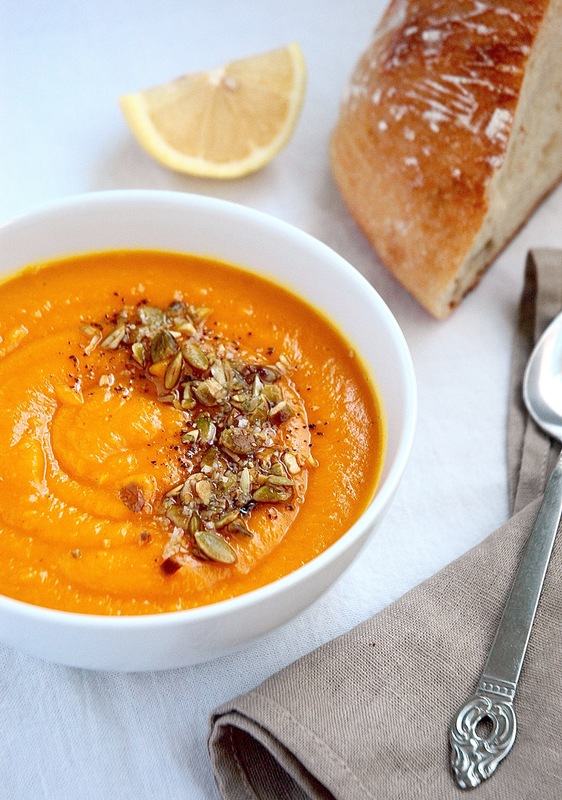 Well, this Curry-Roasted Red Kuri Squash Soup is meant to do just that. Let’s all take a moment and enjoy a good, hearty, warm bowl of soup. When roasted, Red Kuri squash becomes so incredibly rich and caramel-y and sweet and smooth. I think taking the time to roast it really develops all those wonderful flavors. Plus, once roasted, you can just scoop the flesh away from the skin easily. No pre-peeling necessary. Just look at the char on that thing. Oh boy, I’m hungry all over again. True, you could probably just peel the darn thing and throw it into a pot of boiling water and make a delicious soup and call it a day. However, I can’t tell you how creamy and decadent and buttery it tasted after the roasting process. (Plus, then you can skip the peeling.) I highly recommend. Since my Red Kuri squash was a bit on the small side, and I wanted to make a lot of soup (hello, leftovers! ), I also roasted a sweet potato and threw that into the mix. Paired with some vibrant spices of curry and ginger, it’s got a really nice kick. 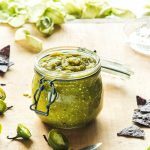 Topped with chopped toasted pumpkin seeds, a healthy pinch of sea salt, a drizzle of olive oil and a squeeze of fresh lemon juice. De-lish. Delish. Delicious. 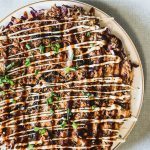 To be honest I shot this recipe about a month ago (I know, I’m so behind on my posts!) but I wanted to make sure to post it before the end of the year. Checking this puppy off that end-of-year to-do list to-day! Ha. And don’t you worry, we’ve got so many big and exciting plans for Kale & Compass in the new year. SO MANY. First order(s) of business: post more recipes, take more photos, create more delicious things, have more good and fun outdoor experiences. 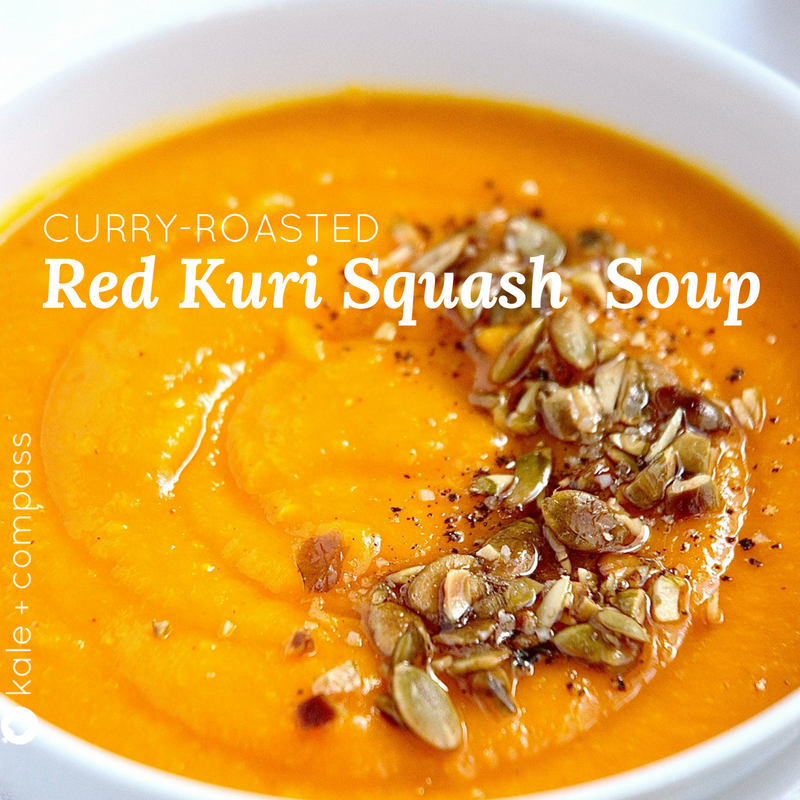 Slow down during this hectic time of year and cook up a hearty bowl of curry-roasted red kuri squash soup. It'll be one of your favorites this season! ROAST: Preheat oven to 400. Place squash, cut side up on a baking sheet with the sweet potato. Roast for about an hour, until both the squash and sweet potato are soft and easily pierced with a fork. Let cool. Once cool enough to handle, scoop the cooked sweet potato and red kuri squash flesh away from the skin and into a bowl. Set aside. COOK: Melt butter and olive oil in a large heavy pot over medium heat. Add onions and cook, stirring occasionally, until soft and beginning to caramelize (10-15 mins). Add the garlic, spices, salt and pepper, sweet potato and squash to the pot. Mix well to combine. Cook for a few minutes, until fragrant. Add water, and bring everything up to a boil, stirring frequently to smooth out the soup. Once boiling, turn heat down to medium low and simmer, partially covered, until flavors have melded (about 15-20 minutes). BLEND: Remove the pot from the heat and use an immersion blender to blend everything together until smooth. 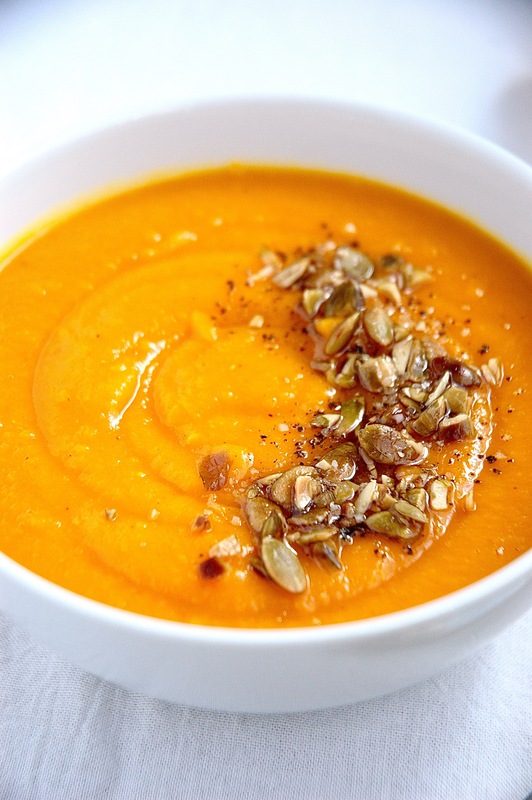 (If using a regular blender, wait for soup to cool and do this in steps, small portions at a time). Stir in coconut milk. Taste test and add more seasoning if needed. 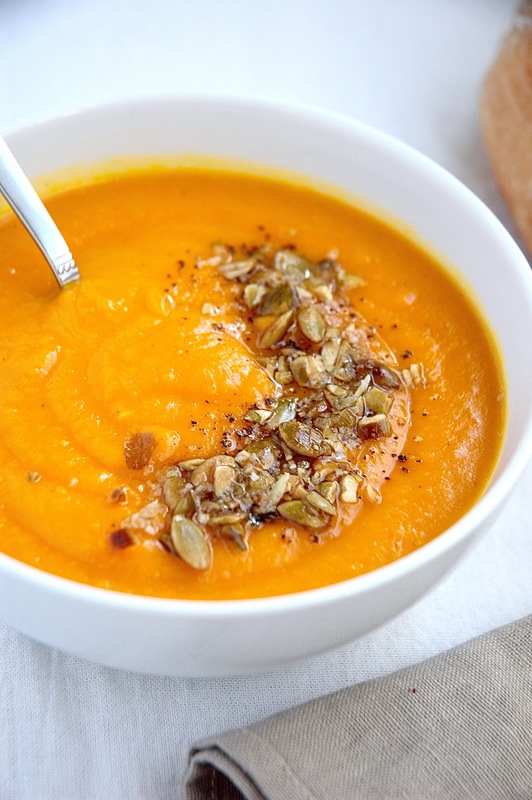 SERVE: Top portions of soup with chopped toasted pumpkin seeds, a drizzle of olive oil, a pinch of sea salt and a squeeze of fresh lemon juice. Enjoy! 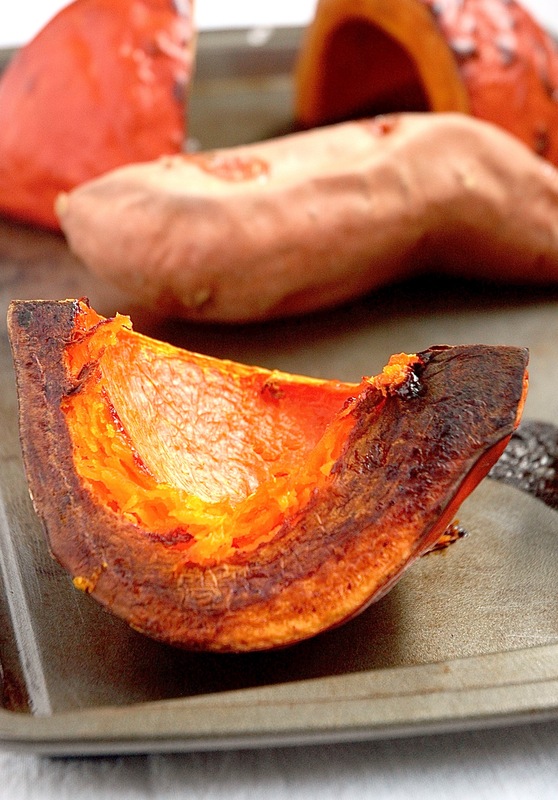 Make ahead: Sweet potato and red kuri squash can be roasted ahead of time. Let cool and store in an airtight container until ready to use.